One of the most reputed and nationally recognized institutions in the area of hair and skin treatment located in Delhi NCR. Nested in the hearts of Safdarjung, New Delhi, and DLF Phase 4, Gurgaon, MedLinks Centre has the most cutting-edge hair and skin treatments. The center offers a unique blend of hair and skin procedures that are unmatched by any other dermatologist center in Delhi NCR. From hair transplant treatment to skin to hair removal to body treatment to cosmetic surgery, MedLinks has become one stop solution for premium dermatologist services. A team of prominent dermatologists and unmatched services is what makes MedLinks the best specialty center for hair and skin treatment. The vision of the center is to offer quality services that are aimed at transforming the way people look and feel. All the services offered by them are as per International Safety Standards and are regulated by USFDA to ensure high-quality dermatologist services. 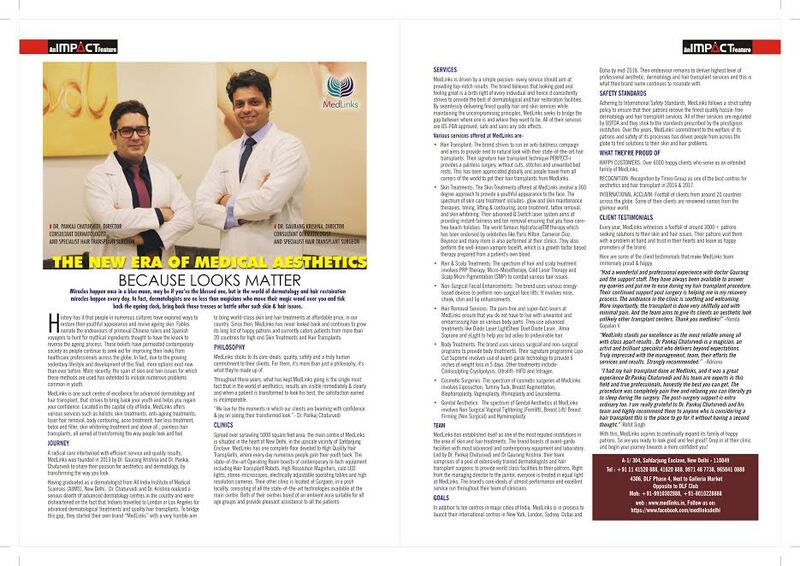 With massive footfall of around 3000+ patients per year across the globe, MedLinks is completely dedicated to bring smile on their faces by offering services that provide top-notch results. For details, call at +91 9650410888 / +91 9971487738.